It’s every campers worst nightmare. An animal attacks in your sleep, ripping through the tent. 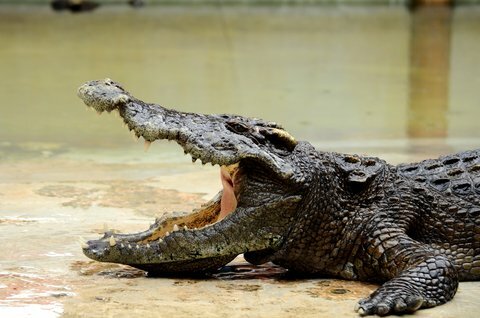 The nightmare played out in reality for a 19-year-old Australian camper who was bit on the foot by a crocodile while he slept in a mosquito tent. Peter Roswell told the Australia Broadcasting Corporation the croc let go of his foot after he struck the reptile on the head a few times. He described how he was sleeping in a bug tent when at about 4:30 in the morning the reptile attacked. “I woke up and there was something shaking my foot, and I woke up and had a look and it was three to four metres long,” Rowsell said. His sister and her partner were sleeping in the bed of a pickup truck when they heard his screams. They reached him a few minutes later and took him to a nearby hospital where doctors treated bruising and puncture wounds. One crocodile researcher reminded folks camping in crocodile infested waters to sleep no less than 50 meters from the water. The same likely holds true for alligators as well. “People break the 50-metre rule all the time. I mean I’ve done it myself in the past, but I don’t think I’d do it today, that’s for sure,” Charles Darwin University’s Senior Research Associate Adam Britton told ABC News.